Another short but great visual novel from Quickie series. This time we continue to follow the story of a young student who studies in Shujin university. 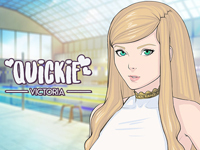 In this part he goes to the swimming pool and meets Victoria.